Every year, Porta Möbel Handels GmbH & Co KG Wiedemar holds a “Charity Day” to give back to the community, in which all sales proceeds from that day are donated to local facilities. 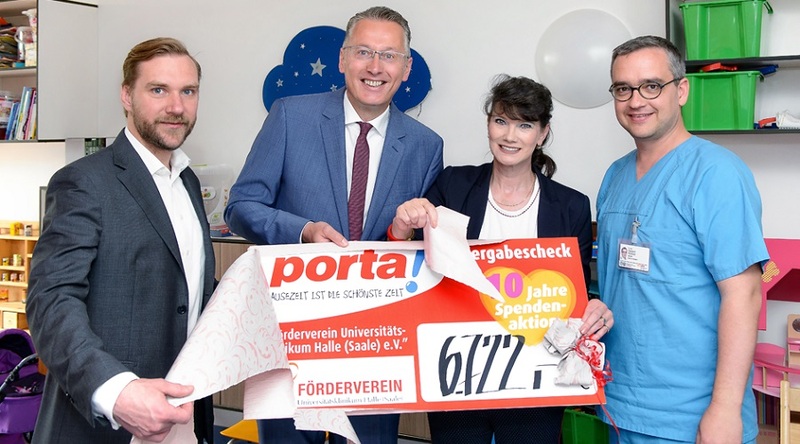 This year on the 7th of May, Olaf Tratzsch (centre left) – the managing director of Porta – presented 6722 Euros to the department of Pädiatrics I of the Universitätsklinikum Halle (Saale). This donation is meant to support research on myeloid leukemia in children with Down syndrome. It was thus received by clinician-scientist Prof. Dr. med. Jan-Henning Klusmann (left) and senior physician Dr. med. Caspar Kühnöl (right), as well as by Heike Grasse (centre right), the honorary chairperson of the Förderverein des Universitätsklinikums Halle (Friends of the University Hospital). Dr. Kühnöl actively supported Charity Day on-site, and educated visitors about the clinnical aspects of leukemia with the help of a microscope. The donation will flow into Prof. Klusmann’s work on complex mechanisms in Down syndrome myeloid leukemia that are mediated by noncoding RNA (ncRNA). In recent years it has become clear that these molecules play important roles in the pathophysiology of cancers, but overall they remain poorly understood. These ncRNAs will be investigated in the context of other genetic mutations, towards developing novel targeted therapeutic methods for children with leukemia.